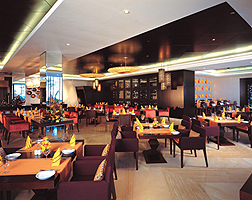 You certainly won’t go hungry or thirsty at the Jebel Ali International Hotel, Dubai. Such is the variety of restaurants and bars on offer. If you like a themed menu for dinner, the Ibn Majed Restaurant brings all kinds of cuisine to the table, like Mediterranean, Middle Eastern, Chinese, and even Polynesian. It also serves a daily breakfast buffet. The La Traviata restaurant offers Italian food that’s fresh and authentic thanks to the Italian head chef. Shooters is an American steakhouse at the Shooting Club with a Steak/Mexican menu, served overlooking the shooting ranges below. The Sports Café overlooks the private marina and its menu is all about traditional pub fare and classic favourites. La Fontana is a poolside option that offers a breakfast buffet, as well as Mediterranean dishes, international flavours, as well as a variety of themed buffets. You can either eat indoors or on the large outdoor terrace. The Anchor is another al fresco venue, this time with views of the beach, Arabian Gulf and golden sunsets. Enjoy sandwiches, salads and light lunches amongst the palm trees. The White Orchid Restaurant nearby brings together the exotic flavours of the Far East, combining Chinese, Japanese and Thai. It serves dinners only in a smart/casual setting. The White Orchid lounge is a chic bar with maritime décor, vibrant cocktails and live entertainment. For a very special evening, get afloat on the DIVAZ and enjoy a sundown cocktail as you drink in the views of the Arabian Gulf.